Helping prepare a child for a lifetime of learning. Reading aloud to a child is one of the best, and easiest, things parents can do to help prepare him for a lifetime of learning. A child who is read to from an early age is far more likely to succeed in school, in a career and in life, because he starts school ready to learn. Also, reading aloud helps familiarize a child with books and encourages excitement about reading. Additionally, reading aloud to a child assists in the development of language skills and vocabulary, and it improves listening comprehension and attention span. It also introduces a child to new experiences and stimulates the imagination. Picture the adventures a child can have through reading: going camping, climbing a mountain, traveling to an exotic land, rescuing an animal or making new friends. The possibilities are endless. Select a book together. Provide an array of new books along with some of a child’s favorites and let him choose the book he would like read. The book should be fun, exciting and interesting for both of you. Young children thrive on repetition, so he may want to hear the same book numerous times. This will help build vocabulary and reading skills. Involving a child in the selection process also helps him build confidence and self-esteem. Get comfortable. Find a comfortable place where the two of you will not be distracted. Sit close together when you read so he can see the words and pictures in the book. 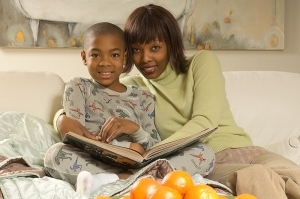 Studies show that when a child associates reading with warm and pleasant parental experiences, he is more apt to enjoy reading throughout life. Help him follow along. As you are reading, point to objects in the pictures and name them. Once a child learns to talk, ask him to identify the objects. Also, move your finger under each word as you read it. This helps a child connect the printed word with the spoken word and begin to recognize letters of the alphabet. Encourage a dialogue. Children have vivid imaginations and love to be involved in storytelling. Research has shown that a child gets more out of a book when he has the chance to talk about it. A child can participate in the storytelling by repeating phrases with you or making sounds to accompany the story. If he asks questions, stop to talk about what is happening in the story. Also pay attention to pictures. Encourage discussion and ask him to predict what will happen next. Let a child’s imagination run free when he finds things in the pictures that are not mentioned in the text. Read with expression and feeling. Use expressive voices and make up sound effects for different characters and actions. Change your voice to fit the action on the page or the overall mood of the book. These inflections can help to keep a child engaged, identify the characters and follow the storyline. Create new stories. Parents and caregivers who are concerned about their reading skills can still be very positive role models. Use the time together to tell stories, which is also a wonderful way to improve language and literacy skills. Or, look at the pictures in a book together and make up the story as you go along. Hearing new words helps expand a child’s vocabulary. The time you will spend together is priceless. Whatever story you read, remember to relax and have fun. Reading aloud is about spending quality time together and creating memories that will last a lifetime. Sharen Hausmann has dedicated her life to improving the quality of care for all children. She is the executive director of Smart Start, the early childhood division of the United Way of Metropolitan Atlanta. Prior to Smart Start, she served as a consultant, lecturer, teacher and trainer, empowering teachers to promote healthy growth and development in young children. In addition, Hausmann is affiliated with a number of state and national early care and education professional organizations nationwide. A Fare Fight By Gabrielle Welch, NC, CHHC Saving kids from processed foods. A Hit That Hides a Hug By Judith Peck Teaching siblings to share the limelight— and everything else. 529 Plans By Abe Pomeranc and John Braca An option for funding your child's education. Academic Excellence By Ron Dietel, Ed.D. Meet your child’s need to succeed in school. 5 Party Ideas By Holly MacLean For an unforgettable bash. A Safe Haven By Jacqueline Bodnar Childproofing your home.